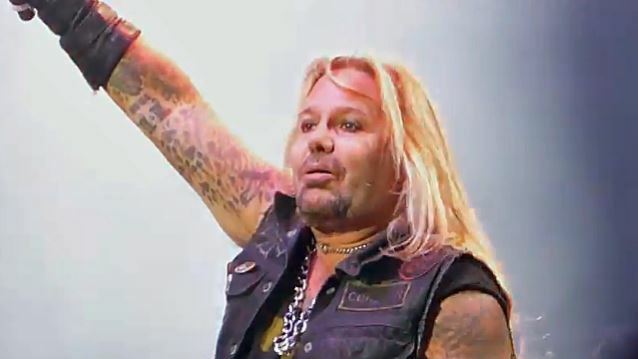 MÖTLEY CRÜE singer Vince Neil has explained to GreeleyTribune.com why he continues to play the band's hit songs during his solo live performances. "I could play a lot of my solo stuff, and I'd get a lot of people in the crowd saying, 'What is he doing that for?' Neil said. "They'd be saying, 'Play [swear word] 'Dr. Feelgood', you [swear word]. "But I don't want to be that guy," he continued. "I want to be someone who shows appreciation for all our fans. Those people have all the love for the CRÜE stuff, and I was the guy singing those songs. That gave me a great life for 30 years." Neil was also full of praise for his solo band, which continues to include Dana Strum and Jeff Blando from SLAUGHTER and drummer Zoltan Chaney. "They're really energetic, and we're friends," Neil said. "There's none of the [bad] blood and the crazy ups and downs with MÖTLEY. We all get along really good." Fan-filmed video footage of Neil performing with his solo band on June 18 at Pompano Beach Amphitheater in Pompano Beach, Florida can be seen in the YouTube playlist below. MÖTLEY CRÜE bassist Nikki Sixx told RiffYou.com last year that his new band, SIXX:A.M., "[doesn't] play MÖTLEY CRÜE music" and will "never play MÖTLEY CRÜE music, explaining that he wanted to make a clean break from touring with CRÜE out of the deep respect he had for all he had accomplished with his bandmates.